I’m a worrying and loving grandmother [and] would like to suggest an emphasis on colored clothing or some bodily adornment for safety. On occasion, runners are in colors that blend with the colors of nature along the roadways they choose for their course. Highway crews and police and fire are attuned to visibility for a good reason. Grandma Barbara’s note struck a nerve because I have had road safety on the brain, lately. I just spent a week at my grandparents’ retirement community. I love it there. My grandparents and their friends are amazing people. 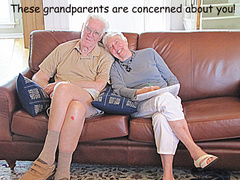 And the Q-tips (as my grandparents call themselves, given their white hair) have FUN. It’s like visiting a resort mixed with a college dorm environment. We had cocktail parties at 2 PM. We played scrabble to our heads hurt. We exercised (water aerobics or speed walking anyone?). We talked about life. 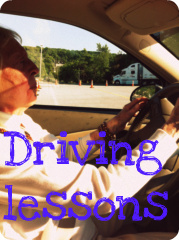 This visit’s hot topic: my Grandmother’s driving test. She has failed it several times. This was her last chance to pass the test. We spent a lot of time practicing parallel parking/hitting barricades and running onto curbs. This prompted tales of “worse” drivers my Grandmother knew, who had: driven through a garage door (and parked car), mistaken a church parking lot for a train station, and ran several joggers off the road. Undoubtedly, some of my grandmother’s buddies shouldn’t be on the road. But the geriatric set is probably more concerned (as evidenced by Barbara’s note) and less of a threat to runners’ safety than most drivers. They aren’t texting or fiddling with their GPS. They probably aren’t driving around at night. They likely aren’t speeding past you on a bicycle or motorcycle. Cars aren’t the only vehicles that we need to be aware of, as runners. A runner was recently tragically killed on our local running trail. She was wearing headphones and collided with a cyclist when she went to turn around. I don’t say this to scare you, but this incident highlights that it’s not just roads and cars that pose a threat. Be aware of all vehicles (cars, motorcyles, bicycles, etc.) and their operators. Pay attention to your safety wherever you are running. 1) Post a picture of you and your grandmother (or a special friend/family member who you want to stay safe for) to our facebook page. 2) Read the 14 running safety tips in my next post. Post script: This post is dedicated to my sweet grandmother and her buddies who are no longer legal to drive on the road, but that sure as heck won’t stop them from speed-walking on it! May we all live to be as happy and active as they are. While I’m not interested in doing a marathon, your tips are great for many runners. This post in particular contains VITALLY important advice. Runners, walkers, and bikers all need to be more aware of their surroundings and err on the side of caution. I used to wear headphones all the time when running, but when I started running in pre-dawn hours, I stopped for safety reasons. I also have invested in some blinky lights and, for daytime hours, try to remember to wear brighter colors. (Bonus: bright colors are way more fun!) Good luck with your site! Thanks so much for your feedback Sherry! I’m glad that you are a cautious and safe runner and promote safety for other athletes on the road. Keep sharing great tips with us – and run safe! Just wanted to share some sad news that one of my retirement home cocktail party buddies in the above picture passed away last week. Therese you will be missed! Even with an oxygen tank, you still sipped wine and knew how to throw a mean party. I only hope that I’ll have as much gusto and pep when I’m retired! It was a blessing to have met you. Leave a Reply to Katy Click here to cancel reply.